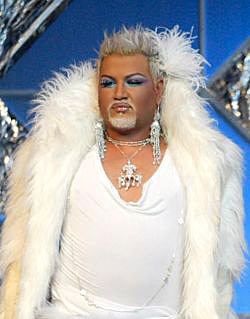 Vasil Boyanov, known as Azis, was born on March 7, 1978. His native town is Sliven but he was grown up in the town of Kostinbrod and the capital city of Sofia. One of his first stage appearance is with Roma ensemble. More popular he became thanks to the Sunny Music producer Krum Krumov. Azis is famous with his scandal manner and shock image because he stakes on the sensual side of his personality.But his vocal capabilities are undeniable. In 2006 he has issued the book "Me Azis" and in 2007 he took part in the Bulgarian edition of VIP Brother.